I am still thinking about of how we find our way through unstructured learning in #rhizo15. One way that I have found to approach learning something that seems out of reach, is by reading stuff completely unrelated alongside each other. I like to go with the flow of the eclectic book partnerships brought together in time through the simple serendipity of my requests for holds coming through at the public library. Here is one such partnership of light bedtime reading. Somehow, Satish Kumar’s No Destination, his story of his young life as wandering Jain monk and Quantum Mechanics: The theoretical Minimum by Leonard Susskind, Art Friedman – make sense, in the context of learning about learning in #rhizo15. They somehow create their own trembling, discordant energy side-by- side. I see learning and wandering, observation/measurement in both from the start. I have quite a strong belief, that physics is out of my reach to understand. I feel tiny and small-brained amongst actual scientists, and that I’m just not “smart enough” or born with the mathematical brain to even be a serious contender for “getting it”. At my most vulnerable, I think people might laugh at me for trying to grasp something so complex. A disclipline for the greatest of minds. But I am really very drawn to want to understand it. It’s like a super-magnet. I can’t help it. In the same mysterious and thought-provoking enchantment that philosophy holds. . But, believe me, I quickly hid that quantum physics book in my library bag after I checked it out. I had this feeling of being embarrassed if “busted” walking around in public on a weekend with this book, as though somehow deluding myself about my own intelligence. As if people would say “Ha, as if you have any hope of understanding that.” I absolutely would feel a bit silly to seen reading this at work where real scientists wander around the corridors. I don’t feel like I’m a league to understand it. I’m not one of the initiated. Did this self-perception of my own learning limitations, impact my engagement with the material? Well, as it turns out, I decided that this definitely is not the “beginners” Quantum Mechanics book for me at the moment. I read the first chapter, flipped a lot of pages, stayed awake for hours with an addled mind wondering how those who dedicate their lives to this quest for understanding, can even cope with the mundane chores like going to the shop for milk. The more I tried to focus on the concepts, the more my mind wandered when I tried. 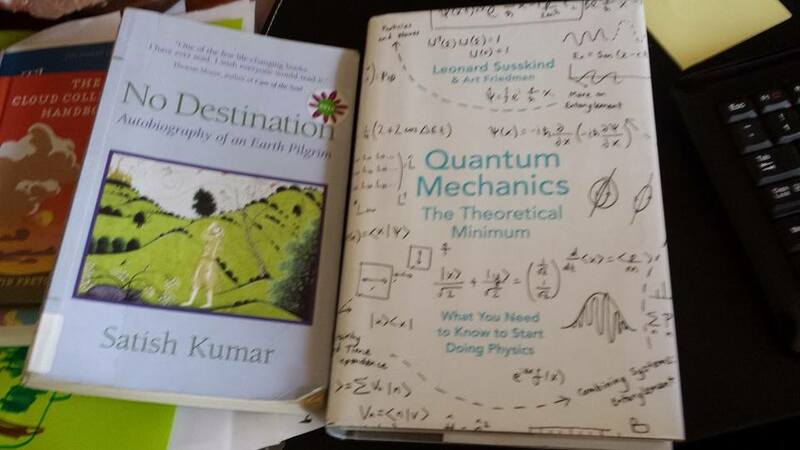 Yes it’s true, I could not make it through the theoretical minimum of quantum mechanics. Perhaps, not unlike Satish Kumar who ran away from his life in the Jain monk order, I too ran away. I returned the library book well prior to its due date. Not the failing of the authors. A failing of me. I ran first to the “bastardised theories” in Dave Bacon’s ‘Learn Quantum Theory in 10 minutes“. Awww cute little quantum birdies and duckies! I began to listen to podcasts and physics lectures as part of routine life (outside of work) whilst ironing, cooking or folding clothes. This seems even more bizarre. This isn’t properly how you learn, distracted by mundanity! And in trying to move sideways into a topic like this, what would my measurement for “success” look like anyway? Would it mean that I would then somehow use this approach to “learn”, “know” and be able to communicate and share my understanding to others?. So – is this an objective? To talk physics over a pilsner with a friend (or ex-friend after that evening). Or to explain it to my kids? Or to get my mum to talk physics with the postman around the corner? How would I know if I get it right? What feedback would I receive? Who is along for this ride? Am I being observed? Do I know who is observing? What impact does this observation have on my output and behaviour? In these random wanderings amongst tricky disciplines – I am aware that I am deliberately being selfishly subjective. What if my wayfinding is actually misleading my understanding? And if decide to deliberately share my understanding of quantum physics, imperfect and fledgling as it is, in turn misleading others, is this bad? How do my own subjective intentions impact on those exposed to my voice in this wilderness? But, every tiny glimpse into this field – it does *something* for my understanding of this world, and that is all. This is how it feels with rhizo15 too – entanglement in big thoughts. To deal with these on a practical level, I will use the opportunities and instruments I have to hand. On clear nights, I will point my telescope to the sky and just simply observe and let my mind wander. Interesting – I’ve been looking at quantum mechanics off and on (rhizomatically I suppose) for more than 10 years now and I still don’t get it! The consolation is that nobody really does but it works and works well so “shut up and calculate” is the approach taken by many practitioners.What goes on in the microscopic world of particles and fields just isn’t mirrored very well, or at all, in the everyday macroscopic world so even basic understanding can be difficult without really getting into the mathematics (complex numbers, matrices, linear algebra, probability etc). Some ideas are more approachable than others though – eg the famous double slit experiment readily illustrates some puzzling phenomena but of course doesn’t answer the question why. I don’t believe that quantum physics is out of your reach as much as modern poetry is out of mine! 10 years Gordon – that’s impressive and makes me feel it’s worth hanging in there. You start to feel shreds of understanding. A quantum professor mentioned “quantum perturbation theory” in a meeting a few weeks ago and I thought to myself “I think relates to something I did understand…the double slit experiment” and I was able to dig a bit more into it. The mathematics side is going to take me longer to untangle as I do feel like running away when I see really complex equations…but equally fascinated to know the story they tell. Strangely what liberates me about rhizo15 is the lack of expert objective way of telling me i did well or not but the dependence on my own. My impostor syndrome has made me manage it by listening to my inner voice to get me thru in whatever way works for me, and rhizo15 allows me to do that iN community. Wow i just wrote a blogpost in a comment. Thank you again!